Less than a month ago, China's MOA announced China To Test New H7N9 Poultry Vaccine In Two Provinces (Guangdong & Guangxi) starting in early July. Roughly 2 weeks ago the MOA announced that the (H5 + H7) bivalent Re-8 inactivated vaccine had been delivered to these two provinces, and the trial had actually begun. Yesterday the MOA announced that nationwide deployment of this new vaccine has been ordered for this fall, even before the results of the Guangdong & Gaungxi trials are known. First, the (translated) announcement from China's Ministry of Agriculture, then I'll return with more on why China is moving so fast, and gambling so big, with this new vaccine. In order to further improve the prevention and control of highly pathogenic avian influenza, to ensure the safety of aquaculture production and public health and safety, according to the current situation of prevention and control, we decided to start from the autumn of 2017 on the basis of the avian influenza of H5 subtype , The national poultry to carry out comprehensive H7N9 immunity, and organized the development of the "national highly pathogenic avian influenza immunization program" (hereinafter referred to as "program", attached). We hereby inform you of the matter as follows. First, strengthen the organization and leadership. All localities and departments concerned should fully understand the serious threat posed by high pathogenic avian influenza to aquaculture production safety and public health and safety, and attach great importance to the prevention and control of highly pathogenic avian influenza. All localities in charge of animal husbandry and veterinary diseases should, under the unified leadership of the local people's government, strengthen departmental cooperation effectively and implement comprehensive prevention and control measures to effectively prepare for highly pathogenic avian influenza immunization. Second, the effective organization of immune work. All localities should follow the "program" requirements, combined with local reality, timely implementation of the implementation of the program, the implementation of safeguards. To actively coordinate the financial sector and the relevant vaccine manufacturers, as soon as possible to adjust the vaccine procurement and supply plan, in the autumn of 2017 unified recombinant avian influenza virus (H5 + H7) inactivated vaccine (H5N1 Re-8 strain + H7N9 H7-Re1 strain ) (Hereinafter referred to as H5 + H7 inactivated vaccine) to replace the recombinant avian influenza virus H5 divalent or trivalent inactivated vaccine, the implementation of immunity to poultry. H5 + H7 divalent inactivated vaccine and the original H5 divalent inactivated vaccine production process and cost are basically the same, as soon as possible with the signing of the contract business consultation vaccine supply matters. H5 + H7 divalent inactivated vaccine funding from the original H5 highly pathogenic avian influenza vaccine funding solution. To effectively strengthen the vaccine cold chain transport and preservation management, to ensure the quality and supply of vaccines. Encourage "first fight after the" pilot breeding enterprises to purchase H5 + H7 divalent inactivated vaccine. Before the immunization work, we should organize immunization training to ensure that immunization is carried out. To strictly implement the immunization file system, to guide the farm households complete, accurate and detailed records of immune information to ensure that immunization can be traced back. Third, do a good job of immune effect monitoring and evaluation. All local animal disease prevention and control institutions to organize the timely development of highly pathogenic avian influenza immune effect monitoring and evaluation work, the avian immune antibody pass rate does not meet the requirements of the requirements, timely relief. On the area of ​​the avian group of immune side effects, immune antibodies are not up to standard, immune failure, etc. to timely investigation and treatment, and timely report I Ministry of Veterinary Bureau. China Animal Disease Prevention and Control Center, the National Avian Influenza reference laboratory should be timely to carry out sampling, evaluation of immune work. China Veterinary Drug Administration to seriously organize the effectiveness of clinical evaluation of vaccines. Fourth, effectively strengthen the vaccine regulation and live poultry intermodal regulation. To strengthen the supervision of highly pathogenic avian influenza vaccine, the full implementation of veterinary drug "two-dimensional code" retrospective management system, to strengthen the quality of the vaccine tracking and full quality supervision, and effectively increase the illegal production, operation and use of highly pathogenic avian influenza vaccine Investigation efforts. In accordance with the provisions of our Ministry No. 2516 notice, the implementation of transport detection system. H7N9 has been required for immunization, need to cross the province of live poultry, according to the provisions of the test. (The same field can be mixed test) or population immune antibody pass rate of 70% or more (PES H7 antibody titer ≥ 24), can be issued by animal quarantine certificate, allowing inter-provincial transport, and Make a record for future record. Fifth, do a good job monitoring reports and emergency response work. National Avian Influenza Reference Laboratory, to further strengthen the highly pathogenic avian influenza surveillance work, increase the etiology of monitoring efforts to grasp the virus epidemic and mutation. To improve the epidemic detection and reporting mechanism, the emergence of suspected symptoms of the flocks, do a good job of differential diagnosis, in strict accordance with the procedures reported. To improve the emergency response plan, the organization do a good job blocking, culling, disinfection, harmless treatment, emergency epidemiological investigation and other emergency response. This document is issued before the introduction of highly pathogenic avian influenza immunity provisions inconsistent with this document, the document shall prevail. 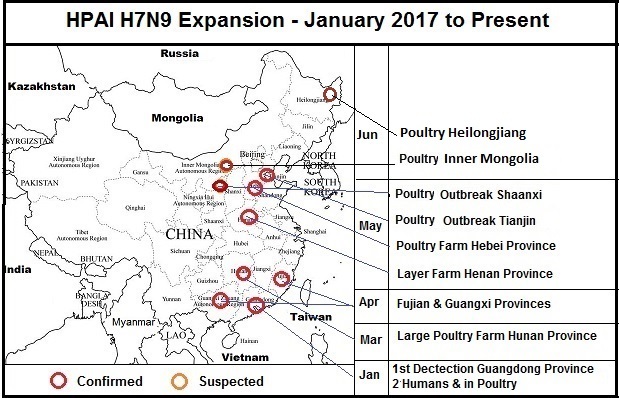 Up until this past winter, H7N9 has always been a low path virus (in birds), and was benign in poultry, even though it could sicken and kill humans. The number of human cases peaked in 2014, and had dropped by 50% over the previous two years, suggesting the threat was winding down. 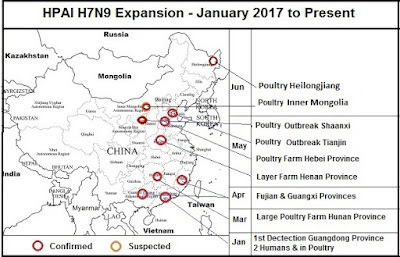 The events of this past winter - the emergence of a new LPAI (Yangtze River Delta) lineage, the emergence of an HPAI version that kills poultry and infects humans, and a six-fold increase in H7N9 human infections - have not only raised new pandemic concerns, but also directly threaten China's poultry industry. Hence the rapid development, and recent deployment of a new, combination H5+H7 AI vaccine for testing in Southern China. Most of the world eschews the use of poultry AI vaccines, and instead follows the OIE recommendations to quarantine and cull infected birds (see South Africa Rejects Vaccination to Control Bird Flu). A few countries - notably China, Egypt, Vietnam, and Indonesia - which have serious food insecurity issues, have opted instead to rely on AI vaccines to control bird flu. As we’ve discussed previously (see MPR: Poultry AI Vaccines Are Not A `Cure-all’ & The HPAI Poultry Vaccine Dilemma), despite more than a dozen years of of heavy use, poultry AI vaccines have proven to be less than a panacea for bird flu. They may suppress bird flu, but they don't always eliminate it. The countries that went with vaccination in 2005-2006 continue to be plagued by outbreaks. The problem is that as avian viruses evolve, poultry vaccines become increasingly less effective; often only masking the symptoms of infection. As an example, a 2012 study (see Egypt: A Paltry Poultry Vaccine), examined the effectiveness of six commercially available H5 poultry vaccines used in Egypt; only one (based on a locally acquired H5N1 seed virus) actually appeared to offer protection. 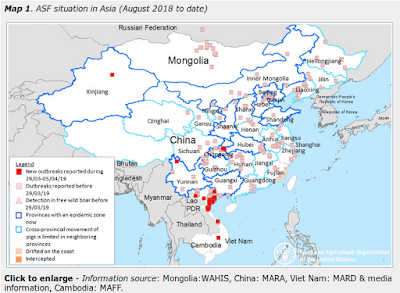 Despite all of these potential AI vaccine downsides, China is already facing a rapidly spreading, continually evolving, HPAI and LPAI H7N9 threat. One that could easily devastate their poultry industry - which would cause massive food insecurity across China (along with societal and political instability) - even if it stops short of causing a human pandemic. At this point, China's non-vaccine AI control options are very few. Which means a lot is riding on how well this new vaccine protects poultry, how effectively it is deployed, and how it influences the future evolution of the H7N9 virus. All questions we may not have answers to for months, or perhaps even years.